BOULDER, COLORADO (The Nil Admirari) - Earlier today, the Republican National Committee (RNC) announced tonight's presidential debate on CNBC will focus on continuing the flawed economic policies that have made wealthy Americans staggeringly wealthier over the last 35 years. In order to effectively reinforce the debate's plutocratic theme, CNBC announced it will not allow Americans to livestream the debate unless they have an overpriced cable or satellite subscription that includes the network. RELATED: GOP Candidates to Make Every Campaign Event "Mandatory Gun Zone"
"Expect the Republican presidential candidates to continue ignoring objective reality by promoting trickle-down economics, and claiming it benefits all Americans. The Republican Party thinks cutting taxes on the rich and causing massive tax revenue shortfalls is the way to go," explained RNC Chairman Reince Priebus, who smirked at the press for an unnervingly long time. 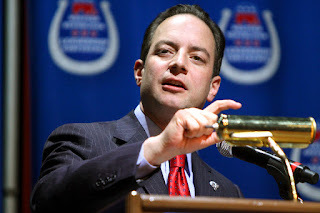 Priebus at the Western Republican Leadership Conference in October 2011. Priebus continued, "Because we'll just blame the revenue shortfall on 'too expensive' social safety net programs like Social Security and Medicare, which are actually fiscally sound. That way we have a pretext to make severe cuts to those programs, and hurt the vast majority of Americans. And then we cut taxes for the rich again to keep the cycle going." CNBC defended its decision not to allow all Americans to watch the Republican presidential debate by declaring, "All Americans who do not pay for the privilege of watching CNBC will simply have to wait for the information presented in tonight's Republican presidential debate to trickle down to them." Even right-wing propaganda network Fox News allowed all Americans to livestream the Republican presidential debate it hosted in August.